Head over to reddit.com/r/cfb to ask the chair anything! We would like to thank everyone over at reddit.com/r/cfb for their help over the past couple years in raising awareness for the chair. The trophy returns for the 2018 meeting between the University of Nebraska and University of Minnesota football teams! 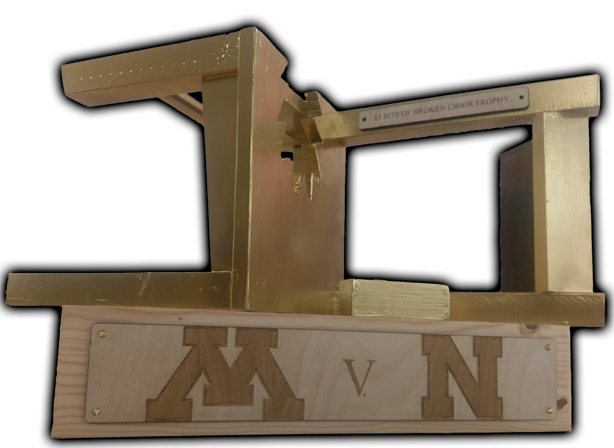 Husker and Gopher fans are banding together once again to resurrect and make permanent this revered football hardware. The $5 Bits of Broken Chair Trophy Returns! The $5 Bits of Broken Chair Trophy returns! 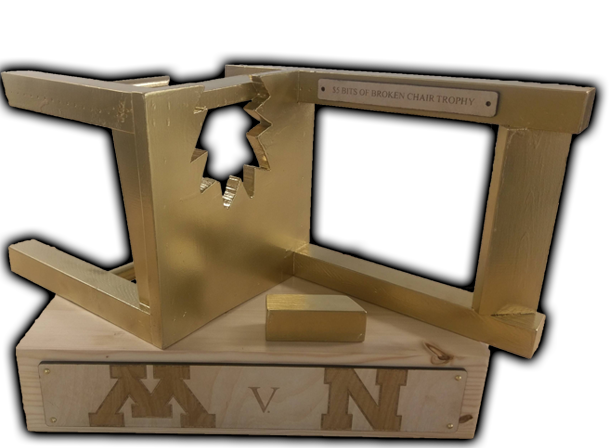 To both preserve the trophy’s future, and to leverage its popularity, fans of the University of Nebraska and University of Minnesota football teams are hosting the second annual Chair-ity Fundraiser. The fundraiser will be held each year leading up to the game and will benefit organizations that are connected to each University. Join us in supporting some great organizations and in the process show each school how much you want to see the trophy game continue by making a contribution today! The organizations benefiting this year from your contributions are the Team Jack Foundation and the University of Minnesota Masonic Children's Hospital. "We are excited to be part of the fan’s efforts in bringing back this trophy. The awareness and funds raised for pediatric brain cancer is a great addition to this event and we appreciate the opportunity. Pediatric brain cancer is the leading cancer cause of death in children affecting 4,600 kids each year. It is important that we make this a national priority which is exactly what being tied to this fundraiser does. We are forever grateful to the fans for including us." The Team Jack Foundation's mission is to raise money to fund impactful pediatric brain cancer research and work to create national awareness for the disease. With an overall survival rate of just around 70%, there is a lot of work that needs to be done in this area. The diseases that we as a society spend resources on ultimately see improved treatments and survival rates. It is time that pediatric brain cancer becomes a member of that community. The Team Jack Foundation was formed out of a grass roots movement which started in Atkinson, Nebraska. The predecessors to the Team Jack Foundation were the family and friends of Jack Hoffman. Now buoyed by a State and Nation's overwhelming support, Team Jack is committed to raising substantial money for the sole purpose of funding relevant pediatric brain cancer research. Funding research that focuses on identifying brain cancer genetic mutations, and then treating those mutations with chemically engineered smart drugs, is a priority. The result will be kinder, gentler, and more successful treatment protocols. In addition to funding research to develop effective drug therapies, the Team Jack Foundation also funds neurosurgical research. A successful brain tumor resection helps set the stage in the fight against brain cancer. One of the best defenses against a brain tumor is a successful neurosurgery. The Team Jack Foundation is unlike other cancer foundations. Your investment in Team Jack is closely attenuated to direct, impactful research. No big CEO salaries. The CEO is a volunteer. Team Jack is comprised of hardworking Team members who are directly impacted by the disease that they are so incredibly committed to fighting against. The University of Minnesota Masonic Children's Hospital is located on the west bank of the Mississippi River in Minneapolis. We provide a broad range of pediatric programs from surgery, imaging and neonatal and pediatric intensive care to cardiac and oncology (cancer care) services and blood and marrow and organ transplantation. Our clinical staff apply innovative approaches to creating medical breakthroughs based their work with patients and on findings through research at the University of Minnesota. This has led to several firsts, including the first successful pediatric blood marrow transplant, infant heart transplant in Minnesota and cochlear ear implant surgery for a child. Through teamwork and collaboration, we respectfully address the physical, emotional, cultural and spiritual needs of pediatric patients and their families. Donations will go to support Child Family Life Services at University of Minnesota Masonic Children's Hospital. This fund supports child family life services at University of Minnesota Masonic Children's Hospital, offering activities and programs that lend support to children and their families. A big thanks to the Nebraska Innovation Studio for providing the space and tools to construct the chair.